It was an evening of unrepeatable experiences at the first music night for hospice fundraiser Childish Things. 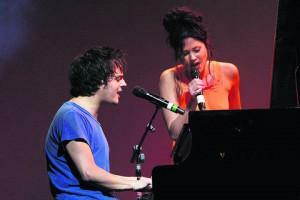 Jamie Cullum performed a never-before-seen duet with Eliza Doolittle. And he then joined beat box champion Beardyman on stage for an unrehearsed jamming session. The event, on Monday at Oxford’s New Theatre, was the inaugural music night for Childish Things, which raises tens of thousands of pounds for Helen and Douglas House hospice.